US President Barack Obama has accepted the resignation of Defense Secretary Chuck Hagel, senior administration officials have said, a number of US news outlets reported. The outgoing Defense chief stepped down under pressure following the Democrats massive mid-term losses and the national security team’s failure to keep ahead of a series of global crises, the New York Times reports, citing senior administration officials. A senior defense official told the Associated Press that Hagel submitted his resignation letter to Obama on Monday morning and the president accepted it. The former senator from Nebraska agreed to remain in office until the Senate has confirmed his replacement. The official added that both Hagel and Obama had“determined that it was time for new leadership in the Pentagon” following weeks of discussion. 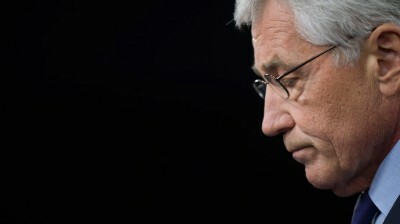 Hagel first assumed the position of Defense Secretary in 2013. Due to his previous opposition to the 2007 surge policy in Iraq and statements critical of the Israeli lobby in the United States, his confirmation was met with significant controversy. Following Monday’s announcement, Hagel will have served just longer than the 20 months his predecessor Leon Panetta held the position. With a military background and less hawkish view of international affairs, Hagel was viewed as the ideal candidate to bring major US combat operations in Afghanistan to an end while managing a leaner Pentagon amidst deep defense cuts. Recent events, however, including the rise of so-called Islamic State (IS) militants and the worldwide Ebola epidemic, “required a different kind of focus,” senior officials told the New York Times. With the White House ramping up its military operations in Iraq and Syria, one longtime associate of Hagel told ABC news the writing was on the wall. “He took the job to end the war–not start another one,” this associate of Hagel’s tells me. Hagel’s departure, could both signal the White House is ready to carry out a more aggressive foreign policy, while also signaling to critics that the Obama administration is receptive to criticism of its perceived mishandling of recent events. It remains unclear who is slated to replace the outgoing defense chief. According to the NYT, Michele Flournoy, the former under secretary of defense; Senator Jack Reed, Democrat of Rhode Island and a former officer with the Army’s 82nd Airborne; and Ashton B. Carter, a former deputy secretary of defense, are all likely candidates.